Last week, we did our regular monthly round up and gave you a summary of our June in Fethiye. In that post, we skipped out on one of the usual sections because there was just too much to write. That section was about Fethiyespor and preparations for the 2014-15 season. Every kuruş counts and all that. Fethiyespor are most definitely not up there with the richest clubs in the world. And let’s get the happy summery bit out of the way first of all. We’ve already told you about the summer souvenir goodies for sale in the Fethiyespor store – it’s hot; t-shirts and baseball hats are good for that. And, as for the sponsorship part, the club are hoping to attract businesses to sponsor the stands for the 2014-15 season. Betonarme (the ‘posh’ concrete stand), Maraton (the stand opposite) and Kale Arkası (behind the goals) are all up for grabs – so let’s see. Makes perfect sense to us. To the untrained eye (that’s our eyes), Spor Toto 2. Lig seems very complicated. The league is divided into two groups with 19 teams in the White Group and 18 teams in the Red Group. Well, the draw has now been made (or however it’s decided) and Fethiyespor are in the White Group. Apparently, on paper, it’s a good group for them to be in. Let’s just get through the season first though, shall we – then we’ll know whether it was a good group or not. The good news is, there are five Istanbul teams in this group and, as lots of Fethiye peeps live and work in Istanbul, it should mean some good away support, too. Let’s see. As yet, the fixtures are not available, but the season starts on 31st August; so if you’re in Fethiye for your hols at any time after that, you could well catch a home game. 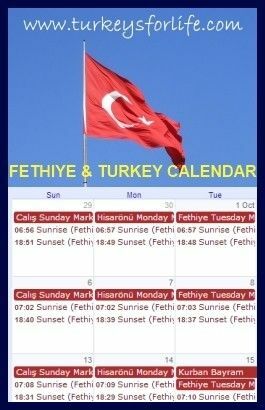 As usual, we’ll add the fixtures to our Fethiye Events Calendar as soon as we spot them. Comings and goings and rumours galore. These are the official ones we definitely know about. There could well have been more ‘goings,’ but as you might expect, they’re not really being celebrated. There could well be more ‘stayings’ and ‘comings’ too, for that matter, but we’ll stick with what we’ve seen on Facebook. But, we’re happy, happy that Sabri Turgut is staying; we like him! Apologies to new signing Muhammed Rıza Altıntaş whose first name is missed off this list but apart from that, we’re really looking forward to seeing what the new team looks like for the start of the season. Individual ticket prices for matches will remain the same: 5 TL (Kale Arkası), 10 TL (Maraton), 20 TL (Betonarme). Season tickets: Maraton 125 TL, Betonarme 250 TL and then 1,000 TL and 1,500 TL if you want to be a VIP. Season tickets apparently go on general sale on July 15th and the start of the season is 58 days away…not that we’re counting or anything. And if you’re trying to decide whether you want to go to a match or not, let us try to convince you with our 15 fantastic reasons to support Fethiyespor. That post was from last year – but all of those reasons still stand…well, just swap ‘promotion’ for ‘relegation’ in Reason Number 2…don’t worry, we got over it.